I've seen this come up a few places, so I thought I'd write up some helpful advice on integrating your shiny new cleric kit into the BG2 cleric strongholds. Players are routed to one of the three potential strongholds in the Temple District based on their class and alignment. After you meet Gaal preaching in the street, you're approached by one of the temple leaders--Arval for Lathander, Oisig for Helm, or Nallabir for Talos--who then initiates the Unseeing Eye quest. After successful completion of the quest, clerics are offered a place in the temple and others are thanked and dismissed. Non-clerics get Oisig and work for Helm. Clerics kitted to one of the three temples always get that temple, e.g. Morninglords of Lathander will always be approached by Arval to work for the Lathander temple. 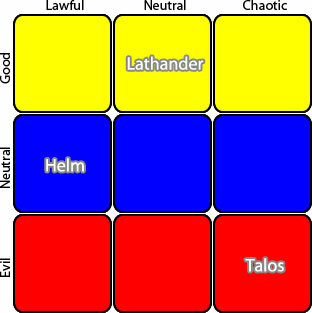 In vanilla BG2 good go to Lathander, neutral to Helm, and evil to Talos. In EE or with Divine Remix installed, Lathander takes NG and CG, Helm takes LN and LE, and Talos takes CN, CE, and NE. LG will get approached by Lathander, but have the option of working for Helm, and TN will get approached by Helm but be able to work for Lathander. If you're satisfied with the existing alignment distribution for your kit, then you're done. For example, EEs introduced the Tyr kit with allowed alignments LG, LN, or NG. Nothing was done for the temples, so (per step 3, above) Tyr priests will either go to Lathander (NG), Helm (LN), or get approached by Lathander with an option to work for Helm (LG). This is the trivial case, of course. Let's take a more interesting example, such as a Tempus kit. Tempus, being CN, accepts followers of CG, CN, CE, and TN alignments. 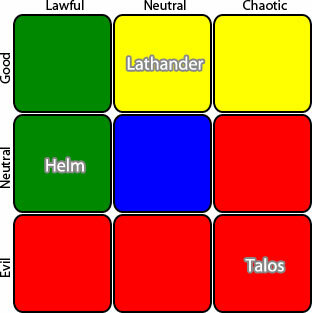 If we let it go to the defaults, as we did with Tyr, then CE and CN followers serve Talos, CG to Lathander, and TN are approached by Helm but can work for Lathander. Tempus and Helm and diametrically opposed, and the idea of Oisig approaching a Battleguard of Tempus for assistance is particularly unsatisfying from a role-playing standpoint. So let's walk through the process of how these mechanisms work, and what we need to do to change them. The good news is that all of this is determined, more or less, by who spawns after Gaal speaks. Once your questgiver has spawned, you're locked into that temple--there are no more kit checks, so if you can get it right up front, the rest will follow. First, the initial spawn of the temple rep. This is controlled by four blocks in the temple district's area script, ar0900.bcs. A quick note, before we go further: the code and snippets are from BG2EE, but the ideas and mechanisms are the same, even if the code required is going to vary a bit. You're basically copying transition 0, but adding new conditions to preempt transitions 1 or 2. In this case, the conditions are that the cleric is a TN follower of Tempus. That's basically it. Once the player enters the temple to speak with the questgiver (Arval, Oisig, or Nallabir) no more kit checks are performed. As always suggestions, feedback, etc. is appreciated. This...is awesome! Thank you CamDawg. This will be very helpful. Super helpful BUT I'm going to ask about more complicated alternatives. The general question: how do strongholds interact? I think a mod (CDTweaks?) allows you to get any stronghold, but only one. So your cleric of Tempus can get the fighter stronghold, and then will not be offered any if the cleric strongholds. Or, you can pass on the fighter stronghold and then have a chance to get a cleric stronghold. Is that relatively easy? Or complicated? Because here's the specific question: maybe my mod wants to allow my added Tempus kit to take Nalia's Keep as a stronghold. Also, it contains a cleric/thief kit called "druid/thief" which is, y'know, a druid/thief. So that one should get access to the druid grove stronghold, and not one of the temples. Another mod of mine adds a version of "demibards" - rogues with bardic characteristics, but no spellcasting, and appearing in the thief class. They would be better off with the bard's theater, rather than membership in the thieves's guild. On the other hand one of them is modeled on the 2E 'Herald' kit, and that one (also a thief kit) should probably get the fighter stronghold. We also have a bunch of ranger kits that are actually devoted to specific deities, and they should probably get the cleric or paladin stronghold. Aquadrizzt has a mod that converts monks entirely into thief kits - which enables multiclass monks. But they should probably get the cleric or fighter stronghold - not the thieves' guild. Etc., etc., etc. It would be amazing if we could compile some more general guidance for manipulating strongholds. Maybe even try to create a library of DLG-specific patches that modders could hook into at the time their kit is installed. The main difference between the cleric stronghold (and hence the reason for this thread) is the fact that multiple *stronghold-givers* are involved, depending on your protagonist. All other strongholds have simple triggers - you have already a stronghold (or not) and your class qualifies (or not). Those checks are simply done in the dialogue of e.g. Nalia, Lavok etc. You can add triggers and variations very easily to those dialogues. The only complex one is the cleric one as outlined in the OP. It is also straight forward to add another party member to qualify for a stronghold if the protagonist does not qualify. (The only thing that made NPC Stronghold mod complex was the additional idea that the respective NPC would also be responsible for all the following stronghold quests and what to do if that one was kicked out or dead etc). Roxanne can we compile a list of stronghold-givers... or even better, a list of .DLG files in which those triggers need to go? It's been a looong time since I played BG2, especially with more than one class. Tweaks should have not only the dialogue files, but the state numbers too. It has to branch the dialogues to bypass the class checks. On my phone ATM or I'd post myself. Bard: Raelis Shai (RAELIS). Haer'Dalis also has a check in his unjoined dialogue (HAERDA). Clerics: As above it's either Arval (BHARVAL), Oisig (BHOISIG), or Nallabir (BHNALLA). Travin (TRAVIN) also has a class check. Druids/Shamans: Verthan (CECHALL). 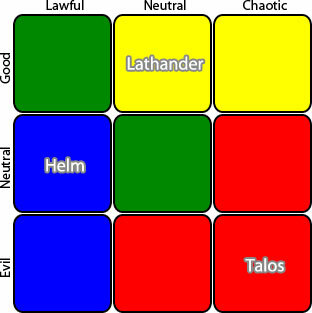 Faldorn (CEFALDOR) also has class checks before entering into single combat with you. The messenger (DRUIDAD) has another check. Fighter Nalia, both joined and unjoined dialogues (NALIA, NALIAJ). Paladin: Garren Windspear (GARREN). Prelate Wessalen (HPRELATE) also has a class check. Looking at Lavok as an example--if you grant his wish and bring him outside, his final dialogue will either be state 27 or 28. If you refuse, then the stronghold check is in the replies to state 59. You probably also want to look at Gaelan Bayle (GAELAN state 70) and Brus (BRUS2 state 0), since they're supposed to point you towards your class quest. I may have a similar 'in' with the Fixpack author for vanilla games. In the second edition, according to my source, the worshipper of Helm could be anything except Evil. Now, I actually would like to see the diety chose be more free... and it might have an effect later in the game on the players alignment... where the quests for example could re-align the player char to be the gods own default alignment/depending on how the strongholds quest was resolved. I'm not fully conversant in scripts the way I am in Weidu. Correct me if I'm wrong but in addition to thst global, you still need to satisfy the class requirements, right? I.e. there is an implicit 'AND' between those 'OR' blocks...? So If I want my kit to get the Lathander temple stronghold, and my kit is a Ranger kit, there would be more to do. The block above just sets one of the conditions in the earlier OR(3) block to true but you still need to match one of the OR(6) in the second block + not belonging to one of the two excluded deities in the last two conditions. Can you provide a "For Dummies" step-by-step like you were tutoring a 5 yo eating sand? And NI's 'Export' action only produces .DLG files.